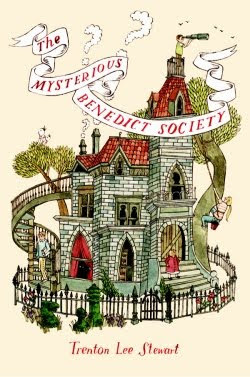 The Mysterious Benedict Society By Trenton Lee Stewart is a tale that involves the smartest of them all. Meet Reynie Muldoon. He is the type of kid that has a brain for solving puzzles and who also is an orphan. Meet Kate Wetherall. She is the acrobatic type of person ever since she joined the circus after her dad left her. Meet Sticky Washington (aka. George). You may be wondering why his name is called Sticky. Well here's why. Any time Sticky reads a book, every little piece of knowledge just seems to stick in his head. He soon ran away from his parents after they put way too much pressure on him. Meet Constance Contraire. She is a little stubborn kid who also is an orphan. As you can see they all are orphans who passed Mr. Benedict's tests. Now they are all on a secret mission to try and find out who is making all of these secret messages in the news broadcasts. It is now up to the Mysterious Benedict Society to crack this code and save the world from danger. I enjoyed this very well written book. I loved the way everything just sort of flows together. When you see these kids journeys through this dangerous mission, it is interesting to see how each and everyone's gift applies in some way. I am so grateful for my friend for suggesting this book to me. I absolutley loved it and I hope you like this adventerous, mystery like book. Enjoy!!!!! Like how sounds, get now!